Between 24th January and 19th June 1572, London, England. John Donne was born of Catholic parents, John, a prosperous ironmonger and Elizabeth Donne. His mother was a descendent of Sir Thomas More. His father was a prosperous merchant. He was the third of six children. Hart Hall, later Hertford College, Oxford and Cambridge University to study law. 1576: Death of his father. His mother later marries Dr. John Syminges. 1577: Death of his sister Elizabeth. 1578: Death of his sisters Katherine and Mary. 1584: John Donne goes to Oxford. 1588: Death of his stepfather John Syminges. 1589: He tours on the continent. 1590: His mother marries again this time to Richard Rainford. 1592: John Donne admitted to Lincoln’s Inn Fields. 1597: Donne goes on an expedition to Cadiz in Spain with the Earl of Essex. 1598: He travels to the Azores with Essex. Becomes Secretary to Sir Thomas Egerton, the Lord Keeper of the Great Seal. 1601: John Donne becomes Member of Parliament for Bracley in Northamptonshire. 1602: He is dismissed from Egerton’s service once he finds out about his secret marriage to his niece, Anne. 1603: Daughter Constance was born. Son John was born. 1605: John Donne travels to France and possibly Italy. Son George is born. 1606: Donne family move to Mitcham and Donne becomes a Protestant. 1607: John Donne takes lodgings in the Strand in London. Son Francis is born. 1608: Daughter Lucy was born. 1609: Daughter Bridget was born. First publication of “The Expiration”. 1611: Daughter Mary was born. Publication of “Ignatius his Conclave” and “The First Anniversary”. 1612: His eighth child is stillborn. 1613: Son Nicholas was born but died within a few months. 1614: John Donne becomes the Member of Parliament for Taunton, Somerset. Death’s of children Mary and Francis. Ordained as deacon and priest at St. Paul’s Cathedral encouraged by King James the First. 1615: He is appointed as a royal chaplain. Daughter Margaret born. 1617: He delivers his first sermon at St. Paul’s Cross. His twelfth child is still born. His wife Anne dies whilst giving birth. 1619: Donne joins Viscount Doncaster on an embassy to Germany. 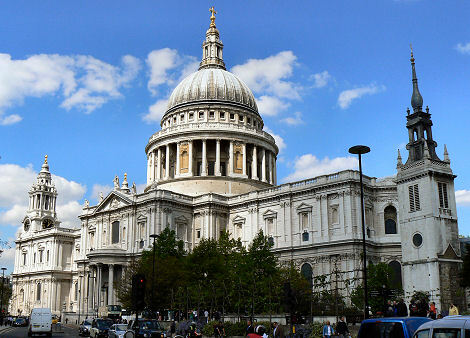 1621: He is appointed as Dean of St. Paul’s Cathedral. 1622: Publication of first two of Donne’s sermons. 1623: He is taken seriously ill.
1624: First publication of “Devotions upon Emergent Occasions”. 1627: Death of daughter Lucy. 1630: His final illness begins. Most of the poems known today were published posthumously as they were originally written for friends or patrons. 1611: “Ignatius his Conclave”. “An Anatomy of the World: The First Anniversary”. 1612: “The Second Anniversary: Of the Progress of the Soul”. 1624: “Devotions upon Emergent Occasions”. (1652): “Paradoxes, Problems, Essays, Characters”. 1601: Secretly marries the niece of Sir Thomas Egerton, Anne More. 31st March 1631, London, England. St. Paul’s Cathedral (Old building, known by Donne, was burnt down in 1666 during the Great Fire of London).